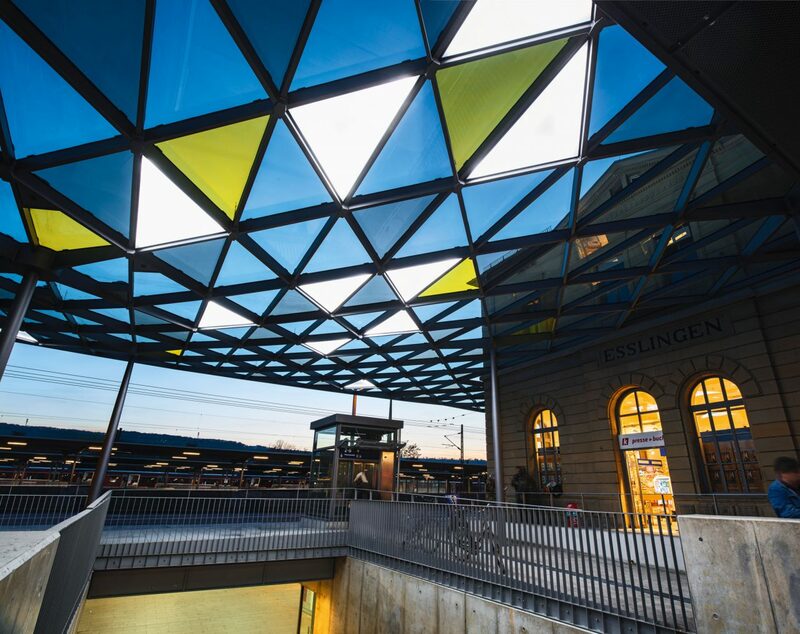 The station forecourt in the city of Esslingen am Neckar was remodeled in order to improve the urban area between the railway station and the town center. 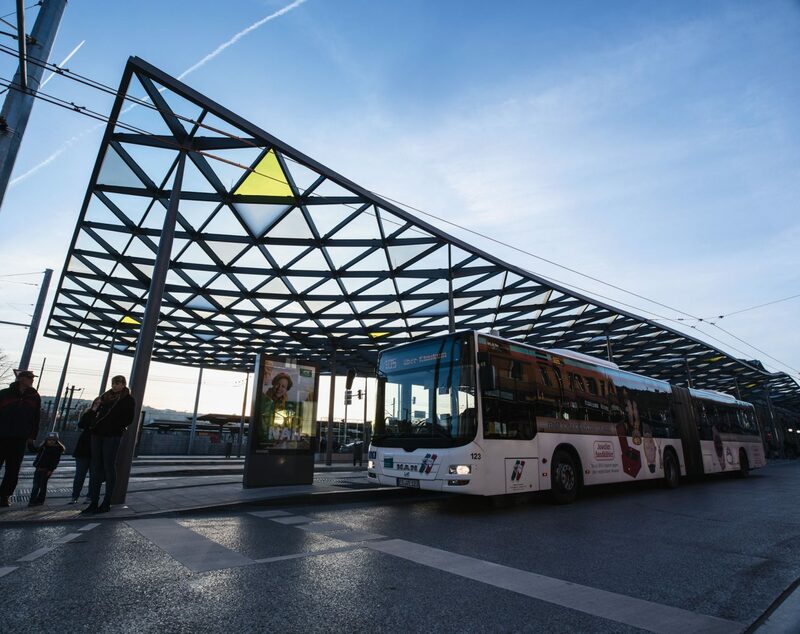 The new bus station was topped with a glass roof in order to make the services more attractive and convenient for passengers and pedestrians going into town or changing from trains to buses, and to shelter them from bad weather. The flat glass roof has a filigree design and is a low-height, free-form structure which undulates wavelike above the platforms. The steel bearing structure is a grid consisting of rectangular bar profiles. The members are assembled to produce a triangular steel girder grille. Depending on how essential they are to structural behavior, the members are tapered and inclined at the ends with a lower load in order to enhance gracility – the height of the members decreases, in other words. The tapered haunch feature can also be seen in the tubular pipe supports holding up the roof. These are embedded in the foundations of the structure. The design concept of stability is thus achieved in combination with the rigid supporting members welded to the node of the support head. 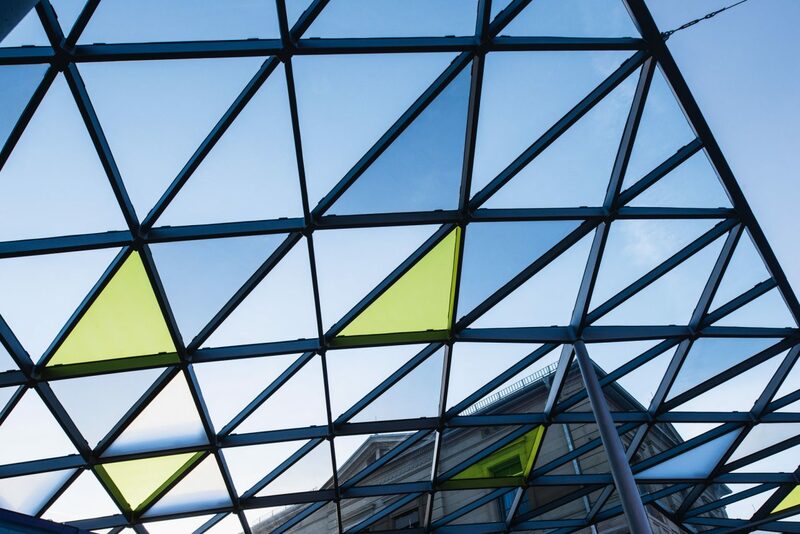 Triangular panels of safety glass in a variety of sizes and angles were used for the glass roofing. Some of the glass panels are transparent, while others are in translucent colors to fit in with the individual lighting concept. The glazing units are fixed on a specially designed sealing system by using clamps in situ. The joints are finished off with a permanently elastic sealant. Water has to be removed from the troughs of the wavelike structure, as it is low in height. This is achieved with channel inlets in the nodes of the glass roof supports. The finesse of the structure and its design are reflected in the complexity of countless details, all of which combine to form the new, attractive entrance of the city of Esslingen.